Today's focus is on creating your own background paper. My nephew celebrated his second birthday with a fire truck theme party. The brick background stamp created the perfect matting paper for my main photo. When you don't have the perfect patterned paper to match your photos, make your own. Let me show you how. 1. 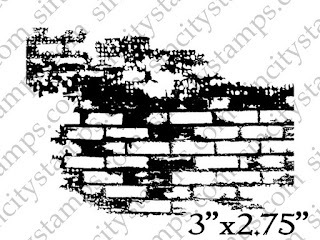 Use black ink to stamp the brick image repeatedly onto white cardstock making sure to overlap the edge of the paper. To make a second generation image, don't re-ink the stamp and just re-position it and press it to the paper again. You may even apply a third generation impression. With each impression the intensity of the design lightens. Re-ink the stamp and continue to fill the background with first & second generation impressions leaving occasional empty spaces. 2. Swipe a red ink pad across a non-stick craft mat and mist lightly with water until you see small beads of ink forming. 3. Next, place the stamped brick panel face down onto the wet beads of ink. Press down gently and move the paper around until all the ink is absorbed. 4. Continue repeating the process with two other shades of red ink until you are satisfied with the blend of colors. 5. Use an ink blending tool to help blend the wet ink and cover any white areas. Then add a hint of rust ink to the brick background panel. 6. Finally, matte the main photo and adhere it to the upper left side of the layout. For more inspiring paper-craft projects from the Design Team, be sure to visit us often at the Sin City Blog and follow us on Facebook.